iPod files recovery software recovers and restore all music, songs, mp3, photos, video albums, contacts, calendar information or any other audio video files lost when updated using iTunes software from your portable music device. Provide support to all major iPod Mini, iPod Shuffle, iPod Nano, iPod Classic, iPod Hi-Fi and supporting all iPod devices (From first to next generation series). 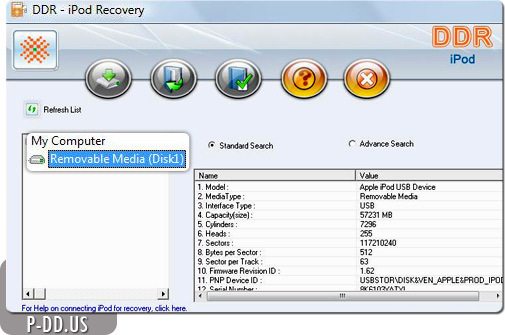 iPod data recovery utility gives you an opportunity to safely find and repair lost, deleted or corrupted music and video files from your portable Apple iPod digital media player. The music recovery software has functionality to fix and restore your all time favorite songs, photos, video albums from your iPod touch wheel, click wheel, scroll wheel in different storage capacity from the Apple iPod software. Data recovery support to all major Apple iPods including iPod Nano, iPod Shuffle, iPod Classic, iPod first to next generation series model. Restore files and folders from logically corrupted and damaged iPod due to human error or any virus data loss. Ensure Data Recovery from accidentally formatted iPod memory. Data Recovery when restore using iTunes software. Revive data back from common error message “Drive not formatted” displayed while accessing your iPod as a removable media on PC. Software to restore music, songs, video files lost or updated using iTunes software. The software is very easy to use and does not require any technical skills to operate it.